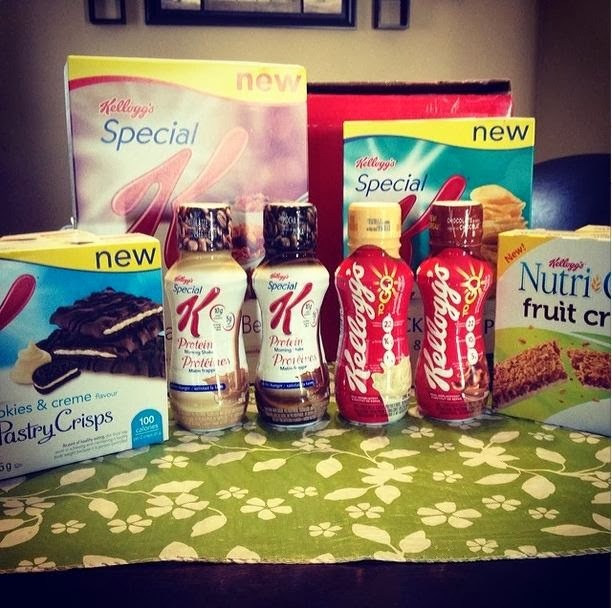 Last week I received a package filled with new goodies from the lovely folks over at Kelloggs Canada. I was super excited to see what new goodies would be in the box and let me tell you, they did not disappoint. Like always, Kelloggs has done it again with great new products that are not only healthy for you, but also delicious. Inside my box was the new Special K Chocolatey Red Berries cereal, new Salt and Vinegar Cracker Chips, Nutri Grain Fruit Crunch, both in Strawberry and Apple Crisp, Pastry Crisp in both Cookies and Cream and Chocolately Caramel along with some new flavored Protein Shakes which included flavors like Cafe Latte and Mocha and two Kelloggs To Go drinks that were in both Vanilla and Chocolate. Let me tell you guys, the cracker chips never seem to last in my house and the Salt and Vinegar was no different. I think I had a handful of them before my son got his hands on the box and munched on them all Friday evening until the box was empty. What I loved most was the Pastry Crisps and the Kelloggs To Go drinks. I love that I get a delicious quick snack that is only 100 calories for two of the Pastry Crisps and that the Kelloggs To Go drinks are a meal replacement that includes vitamins and minerals along with protein and fiber as well, not to mention they're pretty tasty. I don't think there was anything that came in my box that I disliked. Everything was delicious and didn't leave me feeling guilty for treating myself to a tasty snack. Now, Kelloggs Canada is offering one of Just Us Girls Canadian readers a chance to win the same products mentioned above. Be sure to enter the giveaway below and also be sure to check out these new products now available in your local supermarkets.